Learn with Rocket Languages: comprehensive, engaging and cost-effective lessons for your classroom! How will Rocket Languages help my students? Rocket Languages courses have a variety of tools & features to ensure language learning success! 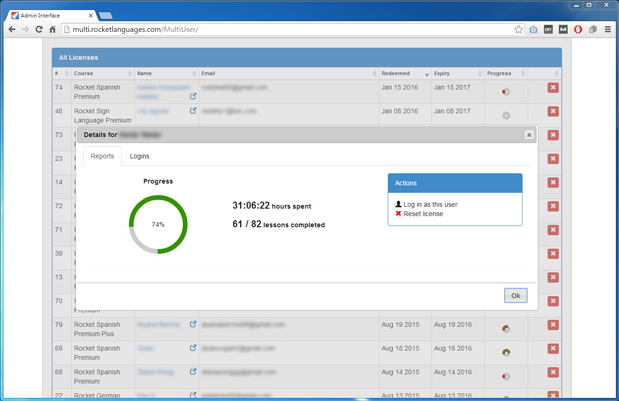 Monitor progress with our administrative platform for teachers. Each language course has over 60 comprehensive lessons covering all your basics in a flexible, easy-to-follow format. Save words to a personalized vocabulary with My Vocab – combine these with the Flashcards for extra practice! Strengthen your students' vocab skills with our fun flashcards. Thousands of words and phrases are included. Students collect points as they work through the course and earn badges for each level. Compare and compete for the top spot on the Leaderboard! Have the convenience of learning anywhere with our mobile apps for iOS and Android. Progress syncs with the desktop version so students can learn anytime, anywhere! How do I use Rocket Languages in the classroom? Whether you are looking for supplemental lessons or a complete language learning solution, we are here to help! Our courses are designed for independent learning so students can work their way through the lessons with little to no guidance. Lessons break down the learning into manageable chunks and the testing tools give extra practice and assist with retention. Our native hosts guide the learner through new vocabulary and language concepts in a simple, relatable way. *Tip: check out the Play It tool which allows the student to practice dialogs with one of the hosts. Play It makes role playing fun, easy and effective! If you already have a set curriculum, our courses are a great supplemental learning tool. Students will be able to create their own learning path, choose between different types of lessons and topics , set goals, use learning tools like voice recognition and flashcards. As the teacher you will have access to an administration area where you can manage accounts, find reports on their progress, and even log in to see their notes. *Tip: Encourage your students to learn outside the classroom using our mobile app for iOS and Android. They can earn points at home too! How do I measure my students’ progress? As a teacher you want to make sure that your students are moving in the right direction. That’s why we provide you with tools to manage your students’ accounts and report on their progress throughout the course. Students rate tests and earn points as they move through lessons. Every lesson has a variety of tests to rate that use a scientific algorithm to reinforce and enhance recall. Module Tests also provide assessment at each stage of learning and give students the opportunity to earn certificates. Teachers or administrators can view these statistics in detail from the Administration area. Our Education Licenses provide students with full access to any course of their choosing for 12 months. 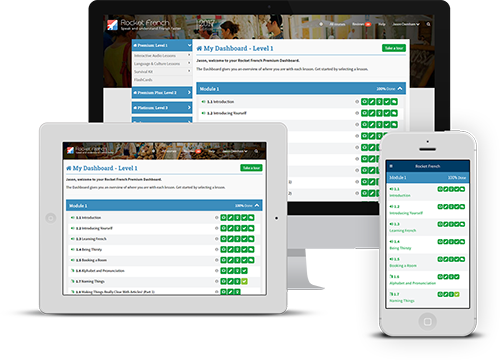 Learners log into their own personalized members areas where they can start learning immediately – no installations, no hassle! If your class changes throughout the year, don’t worry. Licenses are transferable so you can reset and re-assign licenses to a different user or for a different course at any time. What type of discounts or deals do you offer for schools and tertiary? We are committed to language learning and want our learners to succeed! That’s why we offer discounted pricing for schools and educational organizations. Just use the contact form to request a free quote and one of our representatives will get back to you with our discounted pricing options, tailored to your needs. Can I review your courses before making a decision? Absolutely! Simply contact us using the form above to request a free copy or demonstration of any course. You can also browse through reviews from our existing learners below.